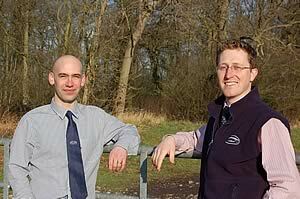 Cogent Breeding Limited announces the appointment of Craig Davidson as Sire Analyst. Hugh Pocock, UK Sales and Genetics Manager, welcomes Craig to Cogent and comments “we are extremely delighted to have Craig on board, he arrives at an exciting time with our breeding programme growing from strength to strength”. Craig brings a wealth of knowledge of cow families and the pedigree dairy business to further strengthen the genetic department. He has an extensive dairy farming background and his family farms at Errolston, Gretna, Dumfriesshire, home to Errolston Holsteins. Along with his parents Brian and Valerie, Craig has been instrumental in developing the herd of 200 high type and production cows. Errolston Holsteins are renowned as one of the top herds in Scotland, winning the Scottish Herds Competition in 2007. The family are also keen on showing, both locally at Dumfries Show and at National events, culminating in winning the Royal Highland Show in 2004 with Stannock Formation Ricki EX93. Craig has always been active in the local Holstein clubs, both at junior and senior level, and is currently treasurer and a committee member of the South West Scotland Holstein Club. Craig’s hobbies include curling, which has led to him becoming a director of Lockerbie Ice Rink. For more information contact Craig Davidson on 07901 914160 or Hugh Pocock on 07789171378.